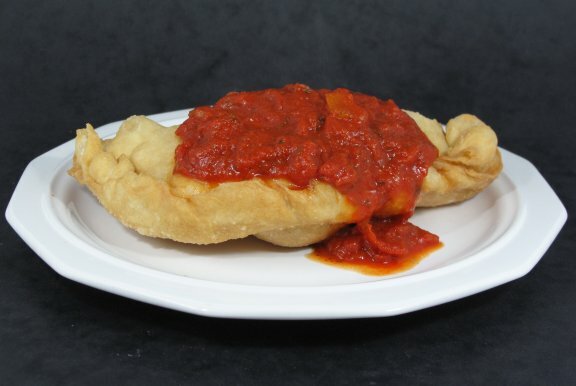 Or if you are Italian “Panzerotti”. 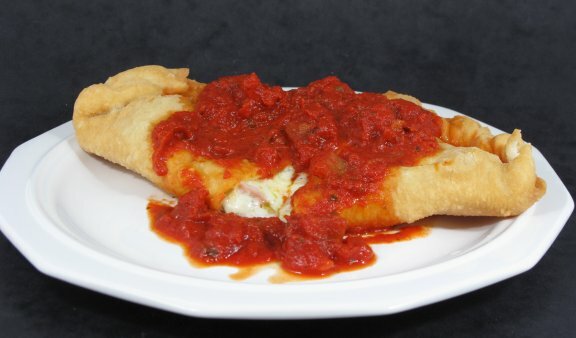 When I was a child in Dubuque, Iowa there was an Italian Restaurant, which served the most fantastic dish called Panzerotti. 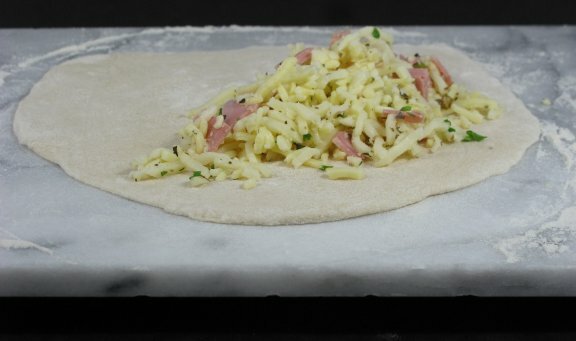 I had the makings for pizza for when the kids came over, but it was getting a little tired so I decided to tart it up! i) It is good to have a cool zone under the heating element of about an inch so that anything that falls into the oil sinks to the bottom and does not get cooked again, hence less carcinogens or food that is burnt over and over degrading the oil. ii) There is a lifetime to oil after which it loses its ability to reach the intense heat. 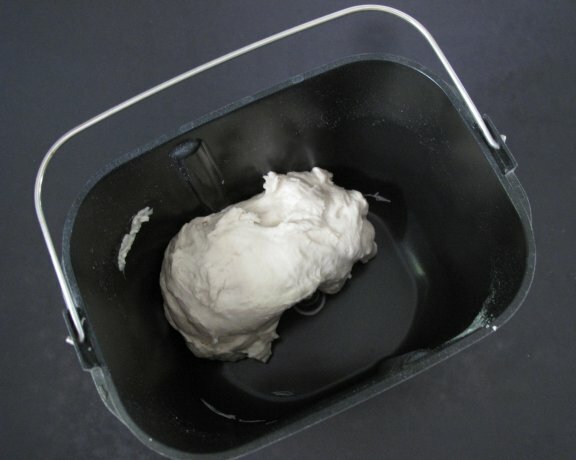 This is due to chemical reactions in the heating process and the addition of burnt food particles. When this happens the oil needs to be changed. iii) You should cook the food as high a temperature as it will stand which causes bubbles of air around the food and keeps the oil away for up to 40% of the cooking time. iv) The grease only soaks back into the food after the heat is removed so dab with a paper towel after removing from the oil, or put on a paper towel lined rack. I have not had a deep fryer for about 15 years. The last one I dropped, full of oil, on the carpet which was ruined. Technology has come a long way since my last deep fryer. On Saturday I bought De’Longhi Coolzone Fryer and two bottles of oil from Costco. It has a cool zone under the heating element – check. 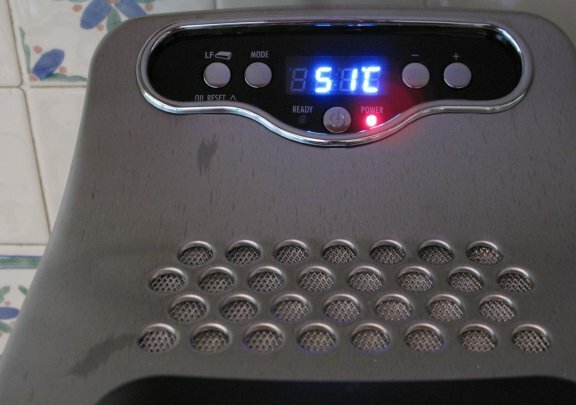 It has a timer for the oil that keeps track of how long it is been heated and warns you so you can change it – check. It has a spigot on the front for easy oil change -check. It comes apart completely for easy cleaning -check. It has a digital temperature gauge for consistent control and goes up to 190C so you can cook hot and not greasy – check. Oh and the killer, BLUE LED’s!!!! I digress into food toys and books, this is about Panzerotti after all. 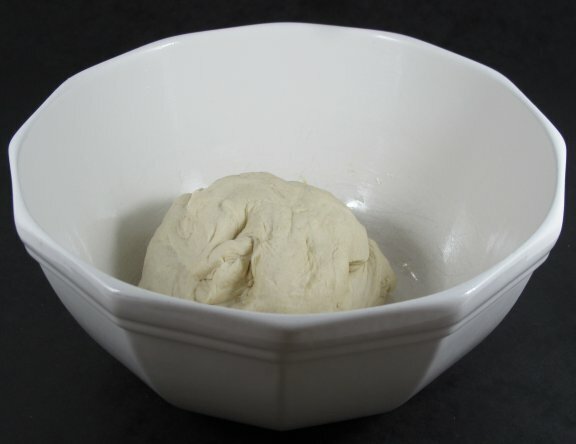 Into my Panasonic Breadmaker and set the selection to pizza dough. 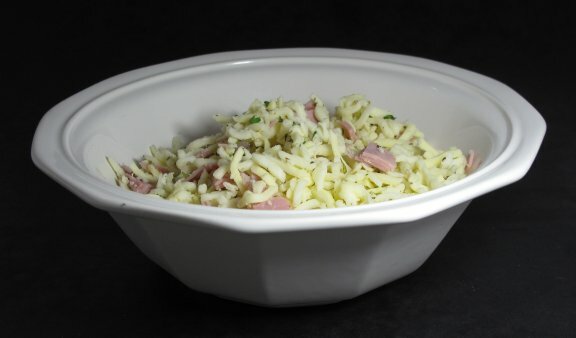 I chopped up about 3 tablespoons of fresh herbs to mix with 500g of grated mozzarella cheese and then added a tsp of celery salt. Mix it with your hands. and ready to put into a olive oiled bowl, covered and put in a warm place. 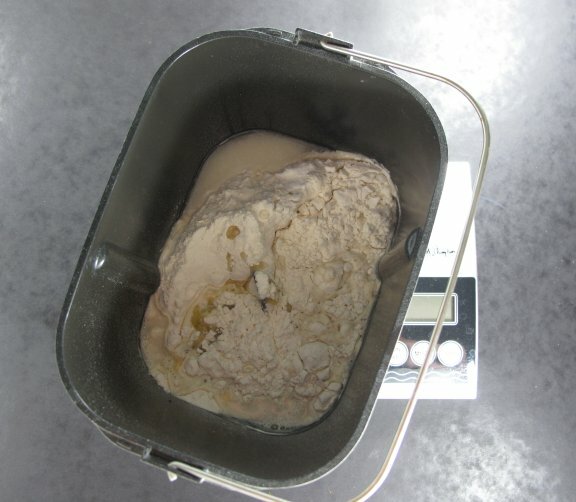 Wait about an hour and the dough would have doubled in size. Punch the dough down (bad dough) and divide into the amount of pies you want, around here that is 3. 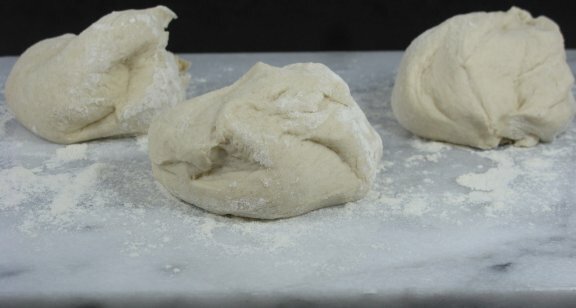 Roll the dough out to a reasonable circle, but make sure that it is not too thin or that there are any holes. Blow outs in the fryer is a drag big time. Put some filling on half of the pie. 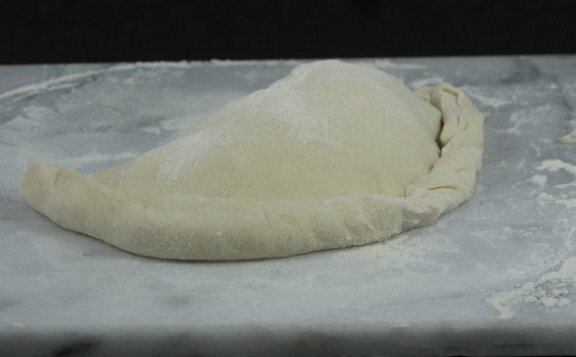 Now fold over the other half and crimp like a Cornish Paste, make sure you have a good seal as like I said a blow out in the fryer is not something you want. Set aside and get your fryer up to 180C. Also get a jar of Dolimo spaghetti sauce and dump it into a pan, cover and turn the heat down to low. 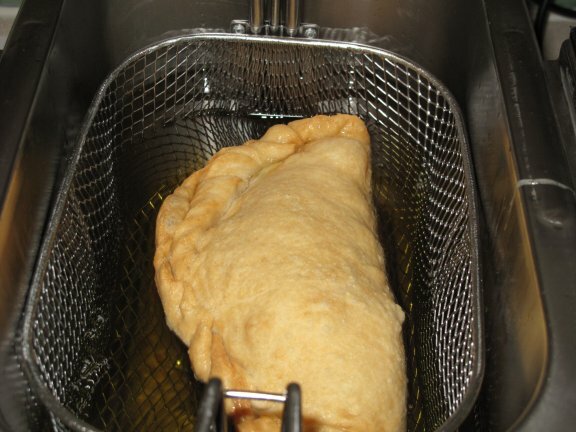 When the fryer is up to heat lift one of the pies and put it in the basket and lower into the bubbling oil. Set your timer for 2 minutes and after it fires turn it over. After it is cooked transfer to two pieces of paper towel and fold one over on the top and pat dry. Now wait for at least 5 minutes. 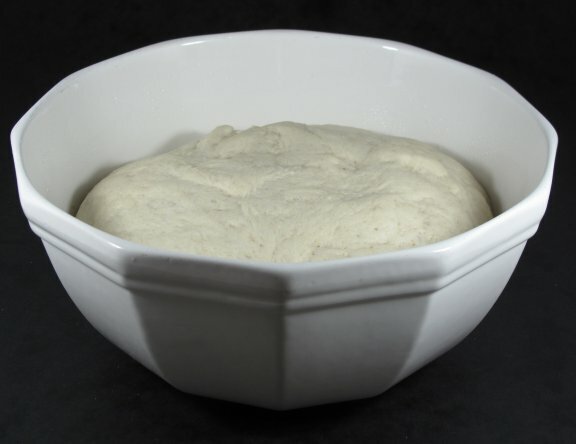 I am not sure what happens here but the dough goes from being hard to soft and lovely. Ladle a couple of spoons full of spag sauce over the top and you are ready for a huge yuuuummmm. Here is what it looks like cut open.